The CHSD 218 Strategic Plan is a five-year plan that is the culmination of a process that began during the 2015-2016 school year and is a direct result of feedback from a large group of stakeholders – students, parents, faculty, staff, the Board of Education, and other community members. The Strategic Plan is a comprehensive document that represents the district’s mission, objectives, strategies, values and beliefs. It is a guiding document for all decisions made in CHSD 218 – a road map for where we want to be in the future. The Strategic Plan is a five-year plan, however it will be reviewed annually to ensure that it continues to meet the districts’ needs and reflects the districts’ values. We believe in the whole child and the need to focus on both the academic needs and the social-emotional needs of our students. The Strategic Plan is a living document that reflects this belief and charts our course for the future, but also remains flexible for new pathways to success. In order to create a plan that is both ambitious and concise, the goals are intentionally broad. However, each goal has a number of worthy targets and corresponding action plans to help us achieve our intended outcomes. Currently, and over the coming months, implementation teams of stakeholders will develop and fine tune detailed plans for implementing action steps to help achieve our goals. A sincere thank you to the many stakeholders who offered their insight and ideas to the CHSD 218 Strategic Plan. Your contributions are sincerely appreciated and duly noted! 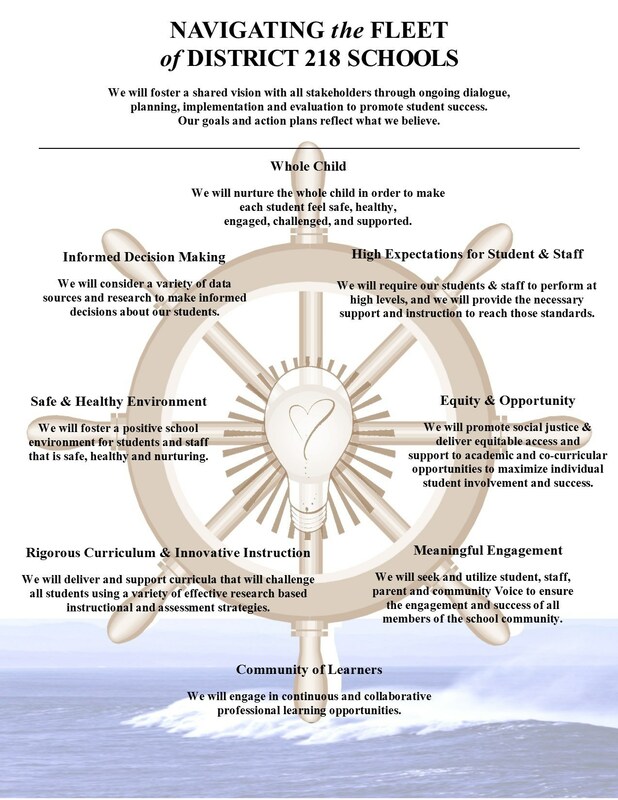 The Strategic Plan is rooted in our shared district values.